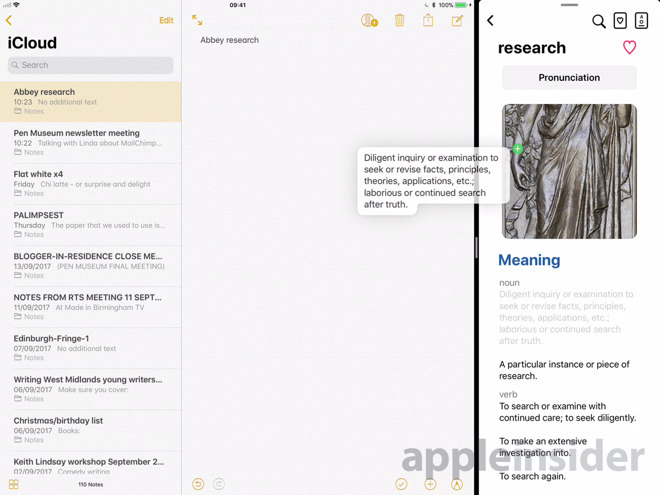 An updated design makes LookUp fast to use on your iPhone or your iPad, and it even has an Apple Watch implementation —but it is not the dictionary app for everyone. While this camera feature is the standout new additions, the most significant in the longer term is version 4.0's adoption of iOS 11's drag and drop on the iPad. Now when you're reading or writing a document and you're not sure about a word, you can drag it straight out of the word processor and into LookUp. Drop the word anywhere on LookUp's window and it will search for its definition. Or say you're writing anything that extensively quotes from a dictionary, such as an academic article or a Dan Brown novel. Find the definition in LookUp, then drag it out to your word processor document. 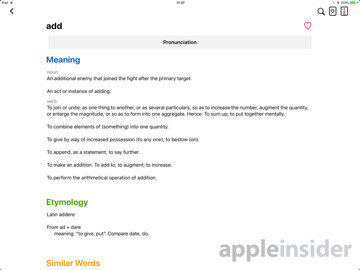 Whether you find definitions by dropping words onto the app or just typing it into the search box the old-fashioned way, those definitions look superb. The app now has a very Apple Music-like layout of font and color which is clear and striking. There are very few controls to get in the way of your reading the definition. LookUp offers only a few tools such as the options to mark a word as a favorite and to change the app from light to dark background on a schedule or automatically. The tool you tend to use the most, though, is the pronunciation button: tap that and a very short audio clip plays so that you learn how to say the word. Whatever the word is, you do also get a photo or a graphic illustrating it. Photographs are more helpful in that they show you what something looks like but the artwork is more appealing because it's so very well done. 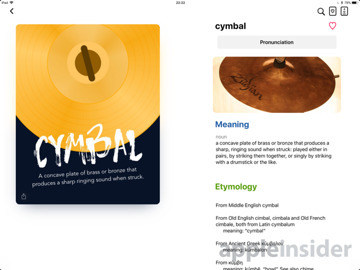 It's an art deco style of illustration, all done by the app's creator, and for what it adds to the design, this is a key reason to enjoy using this dictionary. There is also an Apple Watch app where you can dictate the word you're looking for - which could be handy when you're not sure of the spelling. Dictating some words into the Apple Watch app, dragging others into the iPad version and simply typing into the iPhone one: this is how you will use LookUp every day. The first day you use it, though, you'll be trying out its Look Around to Search feature. It's for defining objects in front of you when you haven't a clue what to search for. Picture husbands in supermarkets trying to work out what's a cucumber and what's a courgette. 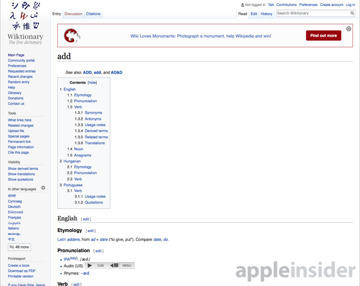 LookUp 4.0 uses Apple's new LookAround tool which provides the developers of apps with image analysis. LookUp's implementation of this is slightly cumbersome to get started: you need to tap into the Search box as if you're going to type a word. Once you've opened that Search box, though, you get a button to switch on this feature. 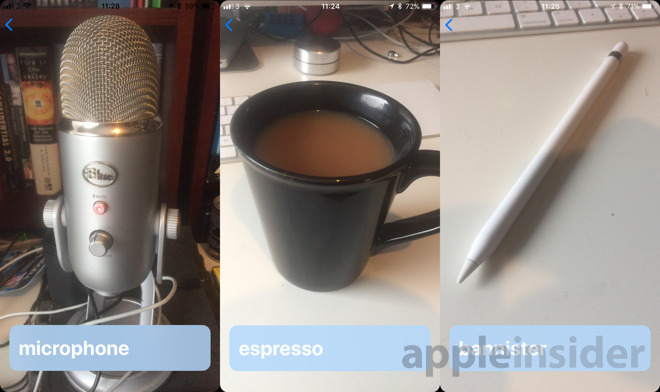 Tap that and the app shows you whatever your camera is currently looking at. 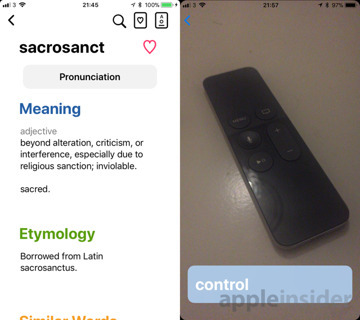 Turn your phone's camera toward some object and LookUp will over lay the image with the word that describes that item. It's a single word and if you're pointing at a lot of objects then it's the one that the app decides is the most prominent in the frame. Tap on the word displayed and you're looking it up in the dictionary. So you just see the object, tap the word, get the definition. However, while the makers claim an accuracy of around 70 percent you're going to need 100 percent luck for it be useful. That's in part because it depends so much on how clear the object is, what angle you're looking at it and what else is in the background. Ultimately, as fun as it is to try, it's not a practical use for a dictionary yet. You can't know that it got courgette' wrong unless you already know that you're really looking at a cucumber. You need to know what the right word is before you can know that the dictionary has got the right word. That said, LookUp is about more than a straightforward definition. It does tell you more and it contains extra information such as text from relevant Wikipedia articles. However, it can do this because LookUp is not a dictionary per se: it is really a viewer for Wiktionary, the Wikipedia-like dictionary. 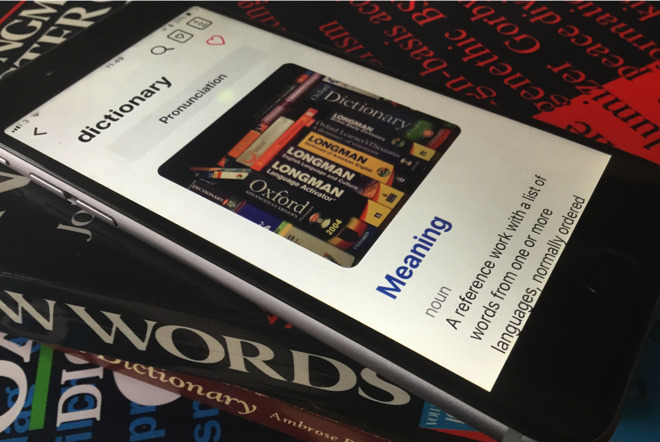 There are no word definitions actually within the LookUp app, they are all looked up for you on Wiktionary. Consequently the app dependent on that website and this can bring a range of small problems. Clearly the biggest by far was when we spotted a definition that should've used a colon and instead had a semi-colon. Look, if you're into dictionary apps, you know this matters. What you definitely need to know is that an internet connection matters too: without one, LookUp won't show you anything. With one, it will show you what Wiktionary says - including any errors. Sometimes those errors are odd choices by the makers of Wiktionary that mean it's the lesser-known and lesser-needed definitions of a word that get sent to LookUp first. That's not LookUp's error but it is something that reduces its worth. What it can be is a reason to just go directly to wiktionary.com on your browser. Go to the Wiktionary website once, though, and you'll see why LookUp is worth getting —Wiktionary is not pretty. More than that, it's ugly enough that it takes you time to find the definition you want. If you're the sort who sees dictionaries as something to wallow in rather than just checking you're not using the wrong word, then TerminologyTerminology from Agile Tortoise is a better option. That has a full US English dictionary built in and is replete with links to definitions and etymology via the Oxford English Dictionary and others. For a concise and gorgeous dictionary that you use to glance at definitions, however, LookUp 4.0 is very appealing. It costs $2.99 on the App Store.